Words can heal or hurt, save or destroy. Words are so important that the Bible describes Jesus as The Word. Often we have tunnel vision and focus on what we think a word means, when God has so much more for us to see and understand. These books give a different perspective on many common words, revealing the divinely inspired and inspiring message in The Word. 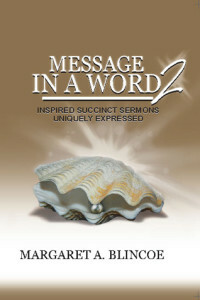 Each book includes 52 acrostics, each of which describes the essence and essential truth of a specific word. In Message in a Word, a short devotional follows each acrostic. If you read one devotional each week, you will have time to meditate on it and absorb what the Lord has for you. In Message in a Word 2, each acrostic and devotional is followed by scriptures to study, applicable questions to ponder, and a prayer. 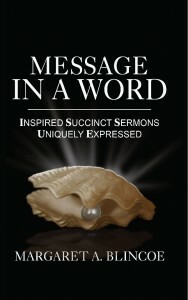 Read what others are saying about Message in a Word. Order a PAPERBACK edition of the books, personally autographed by the author. The author will personally autograph the book to you or the recipient if a gift.Indicate the name for the autograph in the area entitled “Add special instructions to merchant” below the product description on the PayPal order page. The cost of each paperback edition is $18.95 plus $3.00 shipping. Order an E-BOOK edition of the books. After you make payment and see the thank-you page, select the link to “Complete purchase” to be directed to the download page. Click the “download” link and save the file to your computer. You will also receive the download link by e-mail. The downloaded file will be a zip file containing five different e-book formats: .pdf (readable in the free Adobe Reader), .rtf and .txt (readable in your text editor or word processing program), .epub (readable in Adobe Digital Editions, on the Nook, iOS, Sony and other e-book devices), and .mobi (readable in Kindle). Unzip (extract all files) and select the format you prefer. The cost of the e-book edition is $5.95.